The Pyramid Lake season opener is upon us and much like baseball fans in the springtime we start the this season with high hopes and dreams. We are dreaming that this is the year that the 30 pound trout is caught, dreaming of great days fishing with friends and dreaming of starry nights around a campfire enjoying stories of the day and many plans to come. 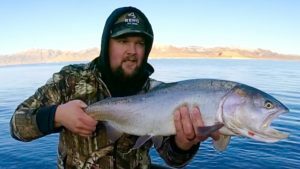 The early season at Pyramid Lake has it’s own unique quirks and personality and the following is a great article from our archives that Mike Anderson prepared on how to approach the early season fishing at Pyramid Lake. This season watch for video fishing reports Mike will put out from the Lake. 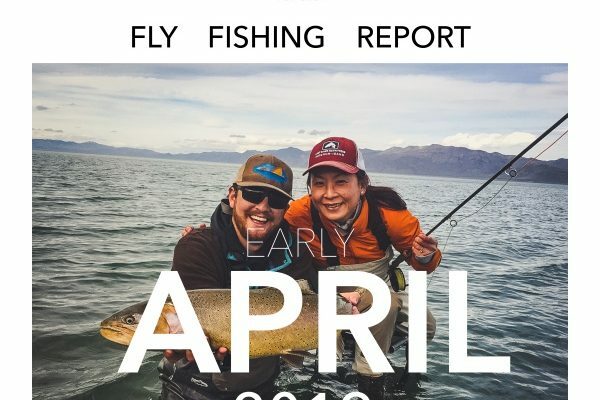 We will post these videos on our social media platforms, our YouTube channel and here on our bi-weekly fly fishing reports. Mike again will be guiding the season at Pyramid Lake. If you are interested in fishing with Mike for a day call the shop soon as his calendar is filling up fast. For all of the staff at the Reno Fly Shop we hope you have a great Pyramid Lake season and look forward to seeing you all in the shop when picking up flies, gear and sharing your stories! Pyramid Lake is finally getting ready to open! It seems like the Reno Fly Shop season wrap up was just upon us but when it comes to catching these fish there is never enough time to truly understand and appreciate this desert oasis. Luckily for us, the lake is in our backyard. We fish it frequently and as a result have developed firsthand experience with its subtleties. More importantly there have been men and woman who have fished and shared their experiences. Combining this information we have formed general guidelines for fishing at different times of the year. The early season which we describe as from opener to roughly Thanksgiving has to be the wildest rollercoaster ride when it comes to fishing at Pyramid. It can be slow one year and electric the next, one thing we do know is that bait fish (tui-chub) are the preferred meal for the Lahonton Cutthroat Trout (LCT) at this time. Fish are aware of the change in seasons just as much as we are. They can sense the days getting shorter and that the water above the thermocline is giving up its heat. It’s time to pack on the pounds before their cold-blooded hearts succumb to winter’s icy grip that drastically reduce their metabolism. Tui-Chub offer these fish eating monsters the massive calories, fats, and proteins that they are looking for. The key to finding the LCT is finding the schooling tui-chub, which we call bait balls. If it’s true there are strength in numbers then these Tui-Chub have mastered self-preservation. Tui-chub will congregate together in giant schools of hundreds, sometimes thousands, to try to protect themselves. LCT will usually follow these schools and will either pick off weak/straying bait fish or will plow through the school to break it up into smaller, easier to manage chunks. Tui-Chub are not as heat sensitive as the trout, and as such will congregate in shallower warmer waters. Trout will have a hard time staying in this warm water for prolonged period of times. Typically the LCT will hold at or slightly below the thermocline, the layer of water that is far enough below the surface to sustain cooler temperatures, and will venture into the warmer waters opportunistically to feed on these schools. Trout are most comfortable in surface water temperatures between 65-68 degrees. Cold weather and wind will cool the warmer summer water quickly. I personally am very optimistic for the opener and early season to be extremely productive. Sinking lines streamer/wooly bugger/Tui-Chub patterns with a booby will be the most effective. 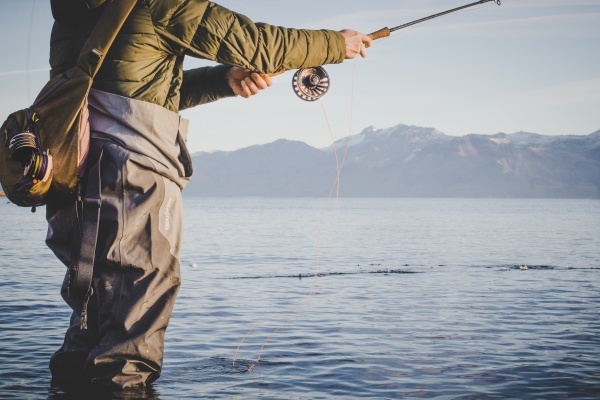 Floating lines and balanced leaches can be very effective too if you can find a deep enough drop off to suspend these flies near the thermocline. 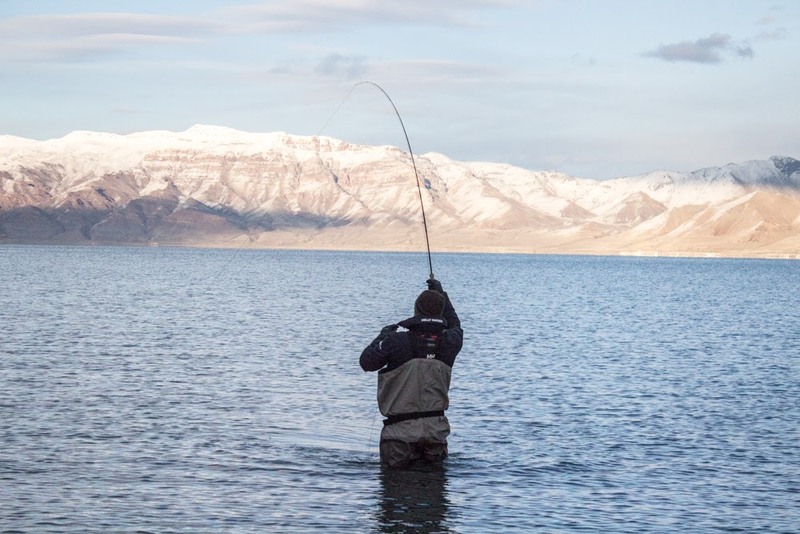 Pyramid Lake should be on every fly fisherman’s bucket list. 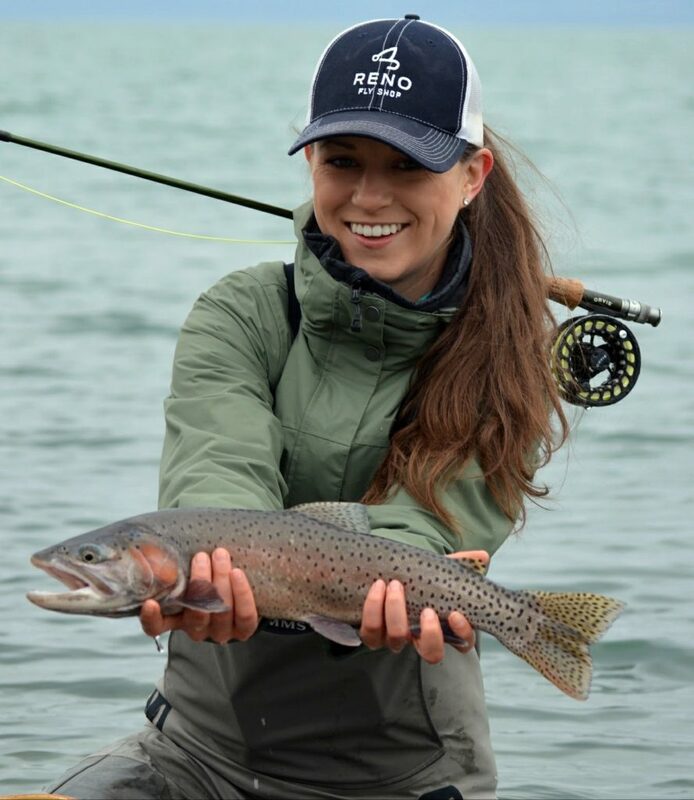 In order to better serve you the Reno Fly Shop has guides available that will share their experience and appreciation for this amazing fishery. Mike Anderson is a guide and instructor at the Reno Fly Shop. As a native Nevadan he has grown up fishing Pyramid Lake and the Truckee River. 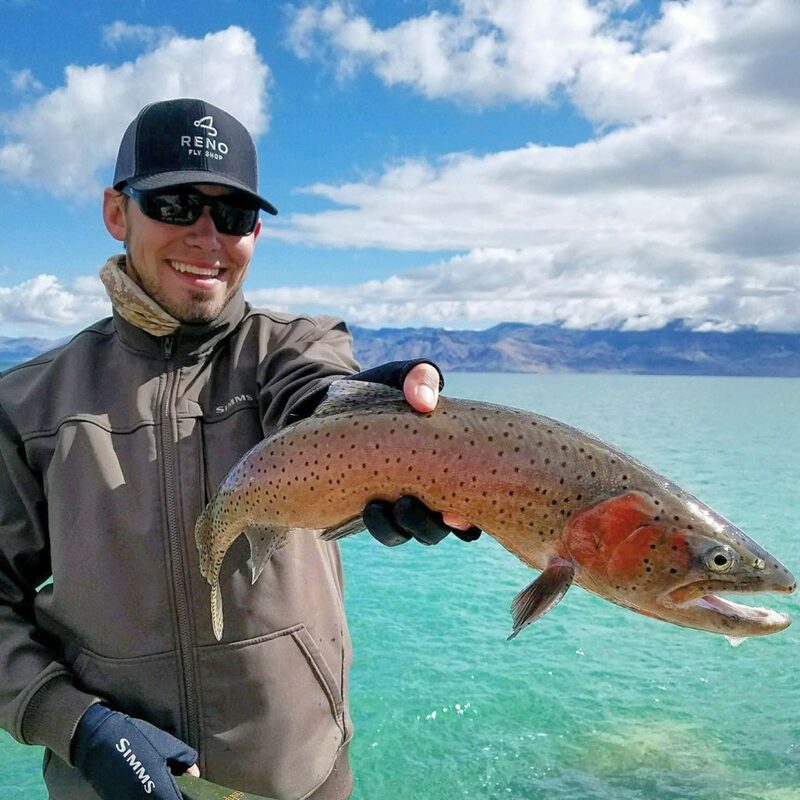 Mike spends many days each year at Pyramid Lake fishing, guiding, tying specialty flies and observing this amazing resource he is lucky to call his “backyard”. 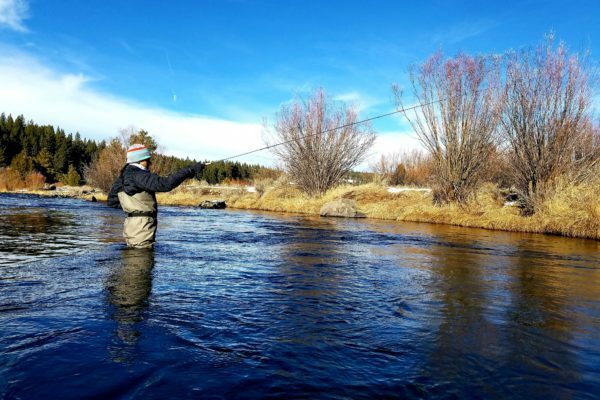 Call the Reno Fly Shop today to book at trip and experience this world class fishery.